The phenomenon of Fire Falls are located in Yosemite National Park, located in California. Named Fire fall because when the water falls from a height of about 2000 feet, similar to the fluid lava that are falling from top. Actually, this phenomenon is not the falling lava, but water that is plunging the effect of the sunlight that will go down. 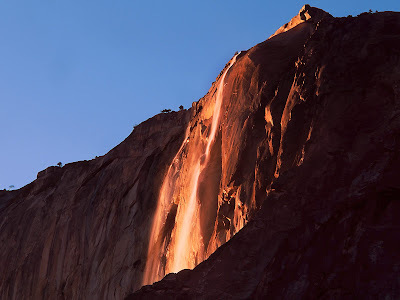 However, this phenomenon must be supported with a sunny weather, the existence of the right when the sun illuminates the water, and water flow enough to be able to make the waterfalls in Yosemite National Park similar to the fluid lava that are falling. 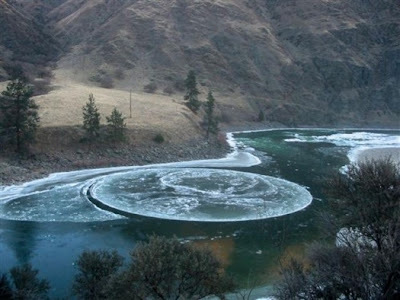 Ice Circle The phenomenon can happen anywhere. Usually this phenomenon oftenhappens in the area that has particularly river flow is slow and cold climate. The shape ismuch like a rotating disc assemblies. This phenomenon has also happened around theyear 1930 in Toronto, Canada. Hearing the name, surely this phenomenon is familiar in our ears. Well, that's CropCircle. A circle has a different motive from one another. This phenomenon firstappeared in the late 1970s in London, England. But in Indonesia this phenomenon alsohas appeared, namely in Sleman, Yogyakarta on January 23, 2011. 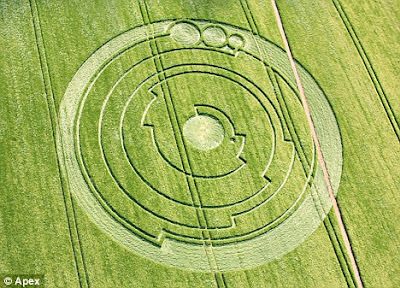 The main cause ofthe Crop Circle making it still saves a lot of questions. What is man-made, made bynature, or man-made creature from the outside world. Now the issue is debated each other, but most of the scientists argue that the Crop Circle was created by creative-handman. This phenomenon happened in the Antarctic region. 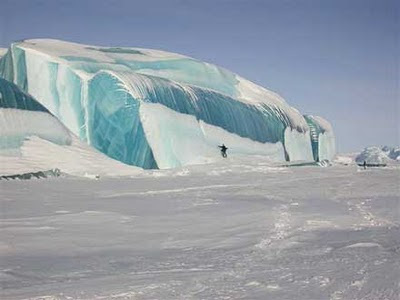 The main cause of this frozen surfof reaction between the snow conditions in Antarctica. For example, when a mountain of ice that fell into the sea it will cause a surf, the surf that will react with snow and frozenproduce surf. Where icebergs falling into the sea to bring algae, then the surf is formedwill have lines like the colors, green, brown, black and yellow. This phenomenon has actually been happened in San Frasisco, and in the state of Indonesia was also never felt this phenomenon which is on January 4, 2011 thathappened in the city of Yogyakarta. But earlier this phenomenon also happened inPadang in 2009. The phenomenon is formed by ice crystals forming a white bow andfreckles are refracted into the sky, creating a ring that surrounds the sun. 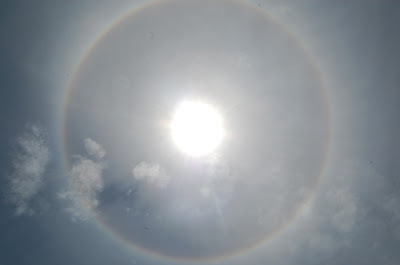 But there areother options that could create a circular ring between the sun, the cold weather factor.Due to cold weather can create ice crystals that have been turned into diamond dustfloating through the air and cause the light that circles the sun. In Indonesia, this phenomenon had happened in the area of Makasar. But how did this phenomenon happen? 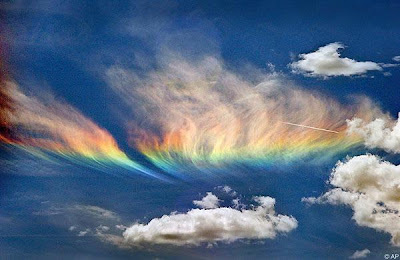 The phenomenon is commonly called 'Busur Circumhorizon' is actually caused by sunlight that penetrate light clouds at an altitude high enough.Because the clouds were formed by hexagonal crystals, the sunlight entering through thevertical surface of the crystals at the top will leave some colors like a rainbow. The phenomenon is classified as a very rare phenomenon. 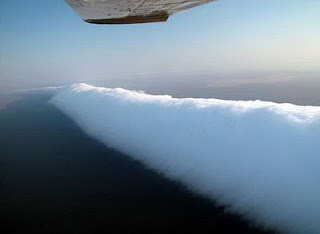 However, this phenomenonhas happened in the Gulf Carpenataria, Australia. These clouds have elongated shapewith length that can reach 1000 km and has a height of between 1-2 km. These cloudsare often also called Solitary Wave or soliton because of its shape like a surf that moveswith a speed of 60km / h.